Far too often bands that form and instantly record albums fail. They're just not ready to play live, yet alone to hit the studio and record something that will be more than a demo. There is an exception to every rule. 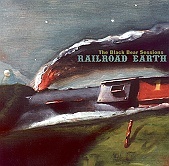 That is the case with Railroad Earth, who formed in January of 2001 and by February 12th they were entering the studio to record what would become The Black Bear Sessions, an album that was originally recorded to be a demo but blossomed into their debut full-length. One of the richest bluegrass albums of the year, The Black Bear Sessions sounds like a group far older than they are, a band that ripened and matured in little over a month more than most bands mature in a decade. The opening track, "Head" is a seven minute number that bounces with a stomping rhythm section and hot fiddle to give the song that essential burn to make you really want to get up and move. "Seven Story Mountain" is a slower, winding song that still manages to make you sweat and move, but gives you a chance to take in the music and breathe. Then there is "Black Bear," a silky, quiet song that just sits there and drops on you like raindrops off of a leaf after a nice spring shower. "Colorado" pumps things back up again, giving you pure bluegrass soul as they bounce and prance around with acoustic guitar and banjo leading the way as the vocals add the melody line to get you singing along. A pure, sweet, refreshing bit of soulful music that is all about the bluegrass, Railroad Earth deliver an exceptional album of modern bluegrass that makes you feel happy and want to have fun. If the O Brother Where Art Thou? soundtrack was a commercial breakthrough for Bluegrass, Railroad Earth is the knockout punch that may find bluegrass the next big thing on the charts. I will give this an A.